Tenet's board of directors faces major obstacles to either selling the company outright or selling off its three main business units in big blocks. Buy, sell, hold course. Whatever the decision, there won't be any quick fixes for whoever takes over for ousted Tenet Healthcare Corp. CEO Trevor Fetter. The for-profit healthcare company carries $15 billion of debt making it prohibitively expensive to be bought outright. And its three main divisions—hospitals, United Surgical Partners International and Conifer Health Solutions—are unlikely to bring enough money at sale to sufficiently reduce debt or, in the case of the hospital business, has no buyer desiring to buy it whole, said Mizuho Securities analyst Sheryl Skolnick. Tenet bought the majority of USPI, a giant ambulatory surgery center chain, in 2015 and now owns an 80% stake. Conifer is Tenet's revenue-cycle business that provides software to hospitals and doctors to help them register patients, authorize their insurance and bill them and payers for care. Tenet owns 77 hospitals, including two in Philadelphia that the company announced Friday that it is selling for $170 million to American Academic Health System, a newly formed affiliate of Paladin Healthcare. "Nobody can or would buy the whole thing," Skolnick said of Tenet. It's been a rocky week-and-a-half for Tenet. Glenview Capital Management resigned two Tenet board seats Aug. 22 to push the company's turnaround from the outside. Then on Aug. 31, the company announced that Fetter would leave by March 2018, or earlier if a replacement is found. Skolnick said she spoke Thursday with Fetter and he stepped down to avoid a protracted proxy fight with Glenview that would have distracted the company from the difficult turnaround it is trying to execute. Tenet did not respond to a request for comment. 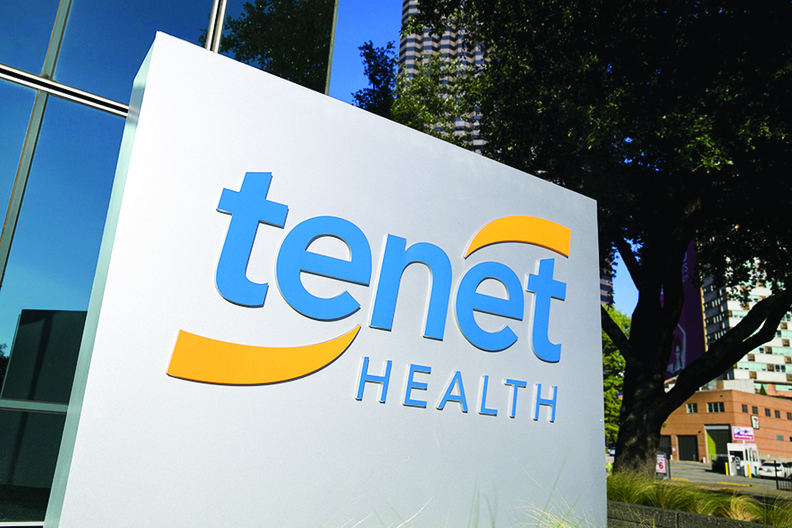 The sum of the three parts of Tenet is worth about $24 per share, said Jefferies & Co. healthcare analyst Brian Tanquilut. That's considerably more than the $17.16 closing price of Tenet shares Thursday. But Tanquilut agrees with Skolnick that unlocking that value will be difficult. For example, the sale of Conifer—which relies on Tenet hospitals and a few other large customers for most of its revenue—would likely fetch just $1 billion in net proceeds that could be used to pay down debt, Tanquilut said. Skolnick called USPI the crown jewel of Tenet. Yet, even if was sold at a high 12 times USPI's annual earnings before interest, taxes, depreciation and amortization would leave about $2 billion for debt reduction. To get that 15% reduction in debt, Tenet would be giving up a division that generates about 21% of EBITDA, Skolnick said. That leaves individual hospital sales—and the hard daily grind of improving hospital operations—as the best way for the next CEO to unlock value for hedge fund Glenview, which owns 18% of Tenet, and other investors, she said. HCA, the nation's largest investor-owned hospital company, has already told Tenet what hospitals it has an interest in and it's not the whole portfolio, according to Skolnick. HCA recently bought Tenet's three hospitals in Houston for $750 million. Tenet is divesting hospitals in markets where it can't attain first or second-place marketshare. The CEO change and an announced restructuring of Tenet's board of directors could accelerate those sales, Tanquilut said. A prime example of selling hospitals in ones and twos was on display Friday when Tenet agreed to sell to Paladin its Hahnemann University Hospital and St. Christopher's Hospital for Children in Philadelphia, along with Tenet-owned physician practices. That leaves Tenet in much the same boat as Community Health Systems, another money-losing hospital chain with big debt that has sold or agreed to sell a total of 30 hospitals in small batches. Like Franklin, Tenn.-based CHS, Skolnick sees Tenet selling its non-core hospitals to regional not-for-profits and maybe smaller hospital chains to fetch the 10-12 times EBITDA that CHS has been getting on its sales. She said the urgency that Glenview is demonstrating by leaving Tenet's board and ultimately prompting Fetter's ouster is heightened by a nationwide softening of admissions that will make the turnaround at Tenet more difficult. "If revenues not growing, you have to reduce capacity and that's painful," she said.